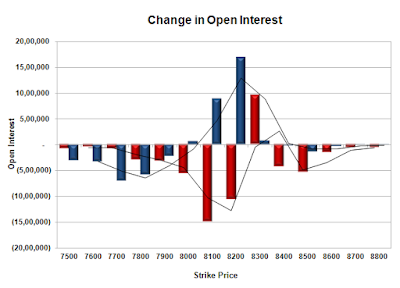 The index opened strong around 8260 and stayed strong on the back of short covering to scale 8300 but closed just below at 8287.75, gain of 83.75 points. The broader market was strong with 1040 advances to 528 declines. Range at the start of the series at 8000-8500. Call option 7700-8800 added huge 53.10 lacs OI with short covering at 8200 strike price. Put option 8400-7500 added huge 55.39 lacs OI. Nifty Open Interest is at 1,14,94,350 up by 32,05,950, with increase in price, probably 100% rollover with huge long build-up. 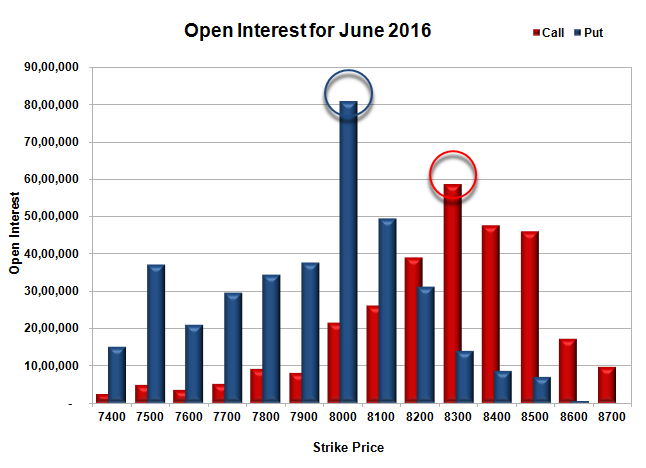 Bank Nifty Open Interest is at 11,51,200 up by 3,43,280, with increase in price, probably rollover with huge short covering. FII’s bought huge 46802 contracts of Index Futures, which includes net 4415 contracts long build-up and 55304 contracts short covering, with decrease in net OI by 50889 contracts, includes 128184 longs to 81382 shorts for the day. FII’s Index future open contract as on date is 178422 Longs to 36525 Shorts, Net long 141897 contracts. Initial support at 8200, with huge OI addition of 10.85 lacs and below that at 8100 with OI of 25.25 lacs. 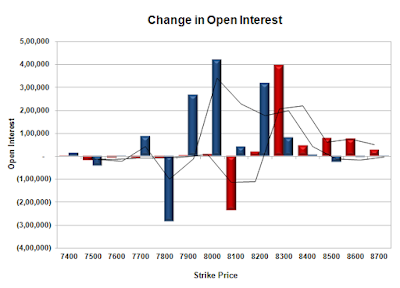 Initial resistance at 8400, with OI of 29.28 lacs and above that at 8500 with OI of 38.02 lacs. Day Range as per Option Table is 8204 - 8359 and as per VIX is 8217 - 8358 with 8279 as the Pivot. 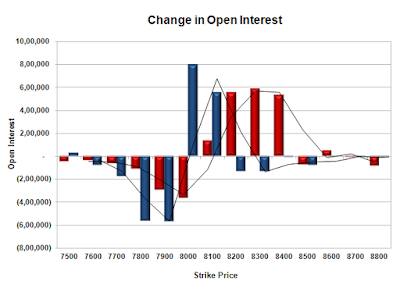 The index opened weak around 8039 but saw smart recovery to the highs of the day at 8120.65 but closed flat for the day at 8094.70, gain of 6.10 points. The broader market was strong with 1221 advances to 337 declines. Expiry week range is at 8000-8300. 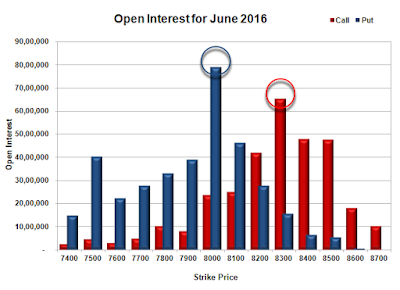 Call option 8100-8400 added 18.07 lacs OI with profit booking at 8500 and above strike prices. 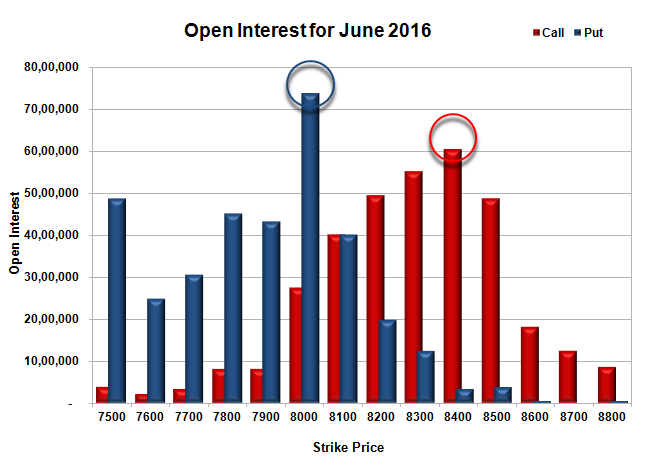 Put option 8100-8000 added 13.49 lacs OI with short covering at 8200 and above strike prices. 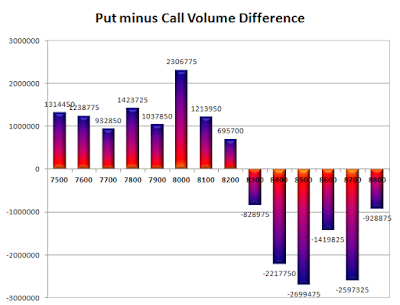 Nifty Open Interest is at 1,21,18,500 down by 13,17,525, whereas next series added 22.88 lacs with no change in price, probably 100% rollover with huge long/short build-up. 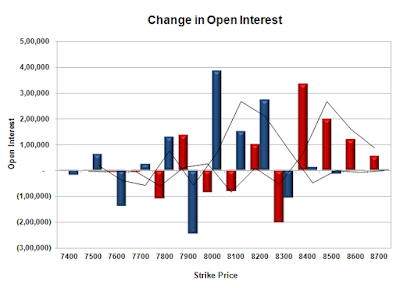 Bank Nifty Open Interest is at 16,52,730 down by 1,12,140, whereas next series added 2.06 lacs with increase in price, probably 100% rollover with long build-up. 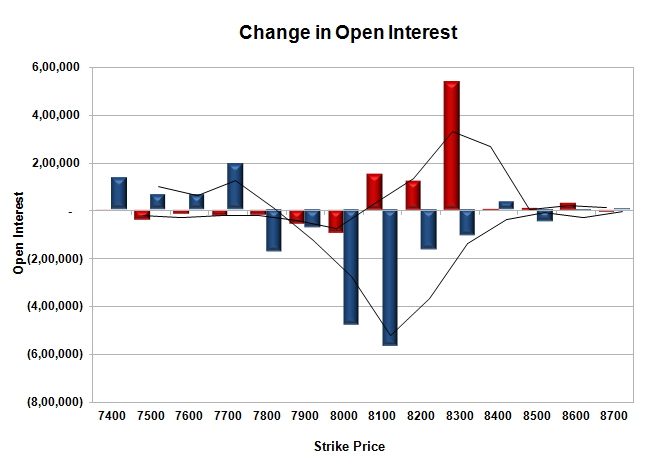 FII’s sold 4822 contracts of Index Futures, which includes net 12451 contracts long build-up and 17273 contracts short build-up, with increase in net OI by 29724 contracts, includes 76416 longs to 81238 shorts for the day. 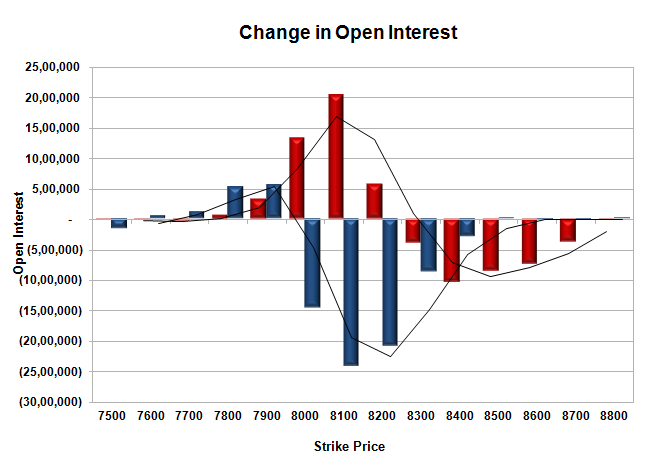 FII’s Index future open contract as on date is 158461 Longs to 75137 Shorts, Net long 83324 contracts. Initial and best support at 8000, with highest OI of 73.81 lacs and below that at 7900 with OI of 43.38 lacs. Initial resistance at 8100, with OI of 40.29 lacs and above that at 8200 with OI of 49.59 lacs. Day Range as per Option Table is 8002 - 8175 and as per VIX is 8016 - 8173 with 8085 as the Pivot. The index opened weak around 8029 on the back of unfavourable Britain referendum and went on to touch the lows at 7927, but closed much higher at 8088.60, still a huge loss of 181.85 points. The broader market was also weak with 337 advances to 1241 declines. Going in to expiry week the range has expanded to 7800-8400. Call option 7900-8200 added huge 42.97 lacs OI with profit booking at 8300 and above strike prices. 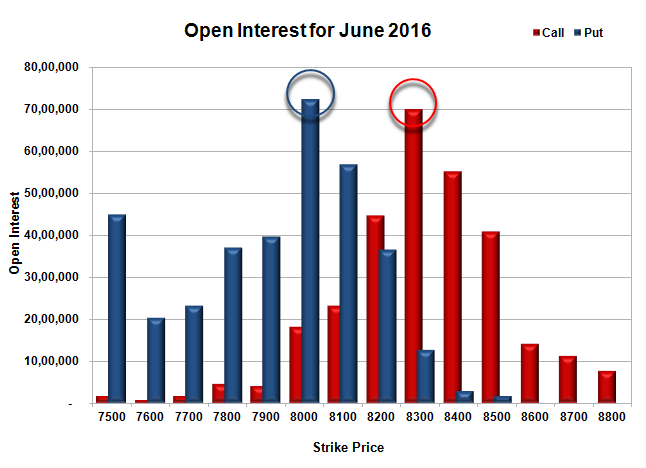 Put option 7900-7600 added 12.53 lacs OI with huge short covering at 8000 and above strike prices. 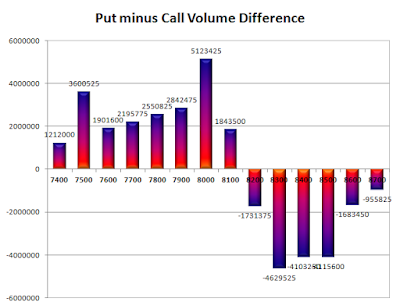 Nifty Open Interest is at 1,34,36,025 down by 24,52,125, whereas next series added 7.95 lacs with decrease in price, probably small rollover with huge long liquidation. 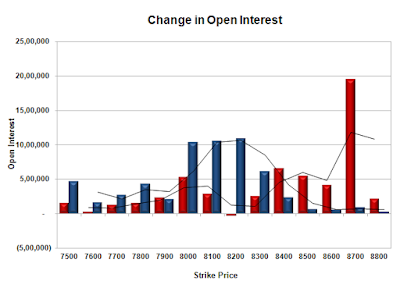 Bank Nifty Open Interest is at 17,64,870 down by 60,540, whereas next series added 0.41 lacs with decrease in price, probably rollover with some liquidation. 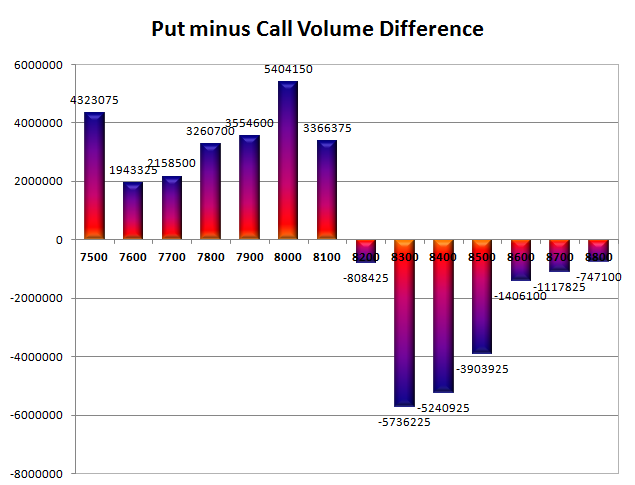 FII’s sold 30614 contracts of Index Futures, which includes net 30941 contracts long liquidation and 327 contracts short covering, with decrease in net OI by 31268 contracts, includes 81801 longs to 112415 shorts for the day. 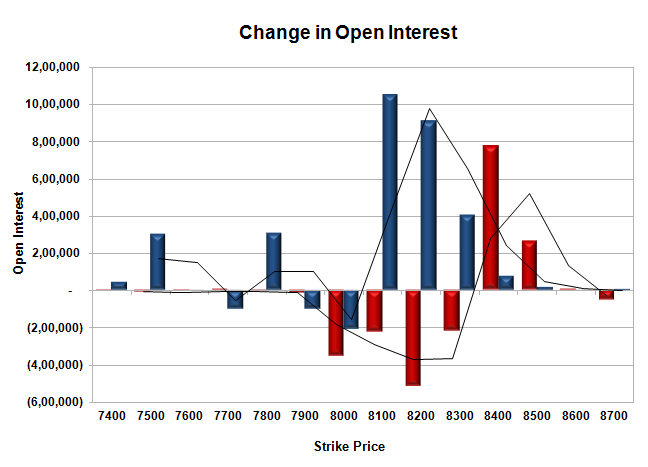 FII’s Index future open contract as on date is 146010 Longs to 57864 Shorts, Net long 88146 contracts. 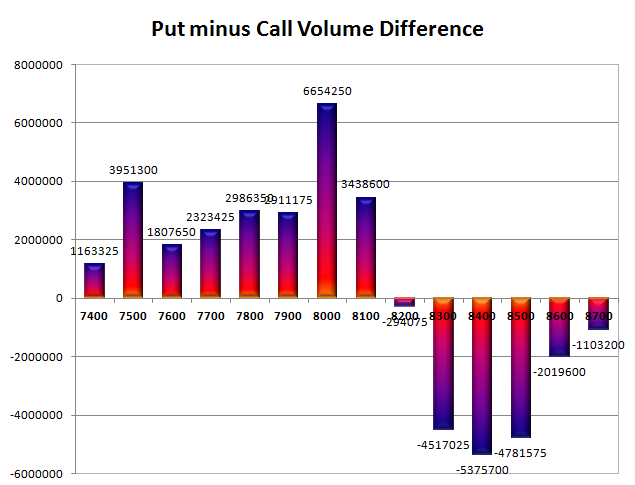 Initial and best support at 8000, with highest OI of 65.86 lacs and below that at 7900 with OI of 49.09 lacs. Initial resistance at 8100, with huge OI addition of 20.46 lacs and above that at 8200 with OI of 44.06 lacs. Day Range as per Option Table is 7962 - 8143 and as per VIX is 8010 - 8167 with 8039 as the Pivot. 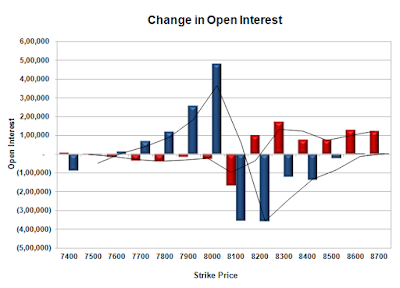 The index opened flat to negative around 8214, and stayed mostly weak for the major part of the day to close at 8203.70, loss of 16.20 points. 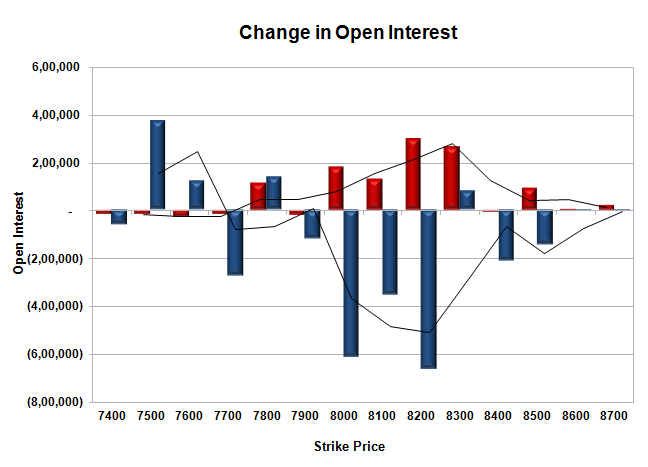 The broader market was weak with 513 advances to 1057 declines. Range for the series now at 8000-8400. 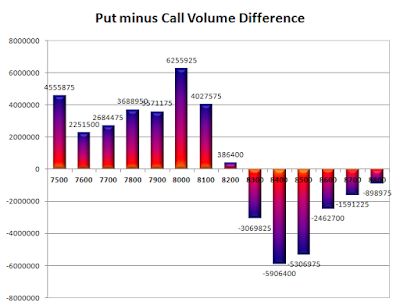 Call option 8200-8700 added 6.64 lacs OI with short covering at 8100 and below strike prices. 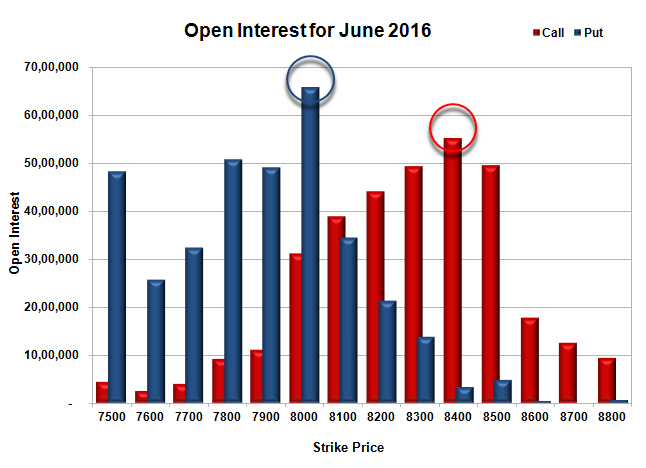 Put option 8000-7700 added 9.17 lacs OI with short covering at 8200 and above strike prices. Nifty Open Interest is at 1,55,60,700 down by 13,33,500, with decrease in price, probably long liquidation. Bank Nifty Open Interest is at 18,00,780 up by 21,900 with increase in price, probably long build-up. 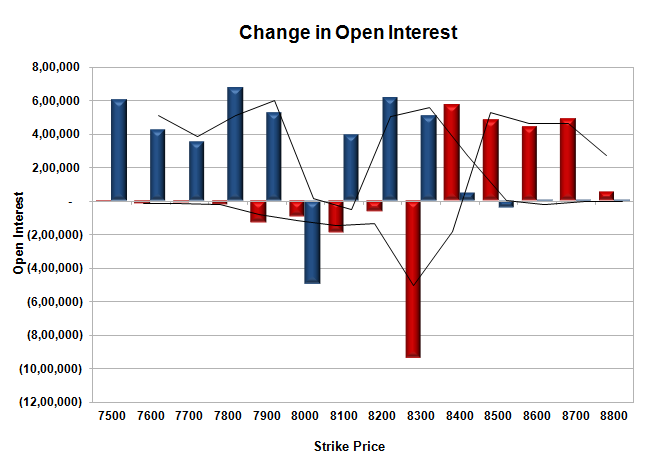 FII’s sold 7739 contracts of Index Futures, which includes net 7817 contracts long liquidation and 78 contracts short covering, with decrease in net OI by 7895 contracts, includes 24116 longs to 31855 shorts for the day. 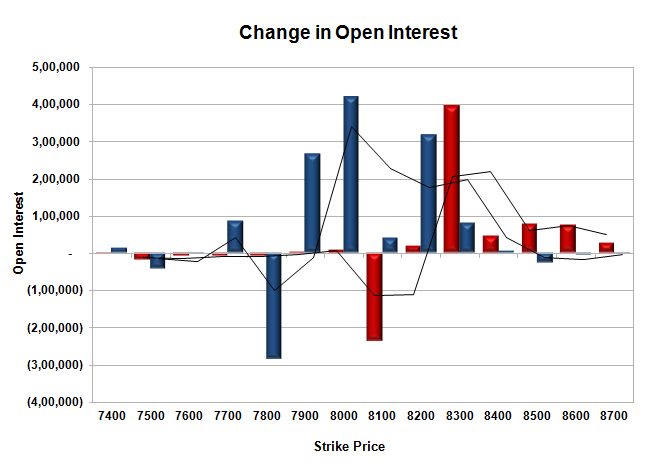 FII’s Index future open contract as on date is 170921 Longs to 56977 Shorts, Net long 113944 contracts. 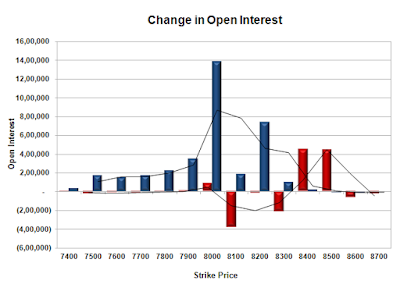 Initial support stays at 8200, with OI of 35.96 lacs and below that at 8100 with OI of 54.78 lacs. 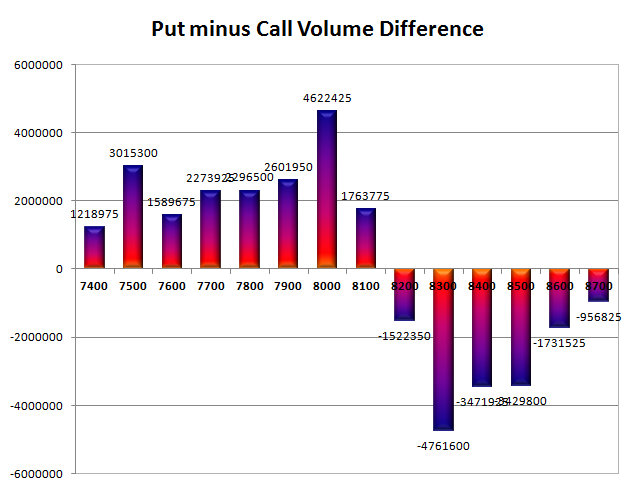 Initial and best resistance at 8300, with OI of 62.68 lacs and above that at 8400 with OI of 59.78 lacs. Day Range as per Option Table is 8136 - 8263 and as per VIX is 8126 - 8282 with 8198 as the Pivot. The index opened positive around 8255, but saw profit booking from the onset to close near the lows at 8219.90, loss of 18.60 points. 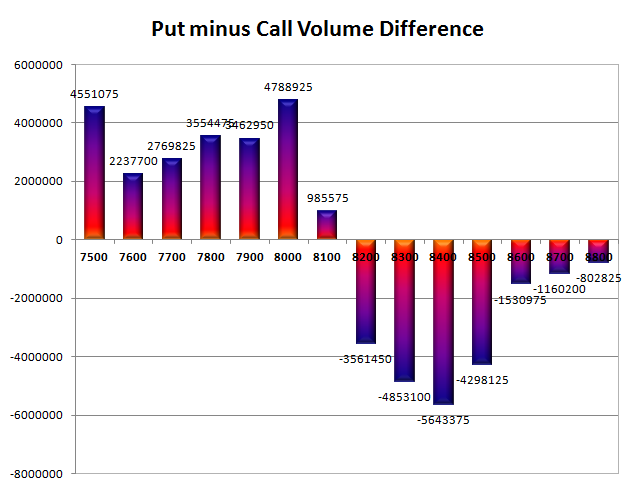 The broader market was negative with 751 advances to 813 declines. Range for the series now at 8000-8400. Call option 8400-8700 added 7.11 lacs OI with short covering at 8300 and below strike prices. 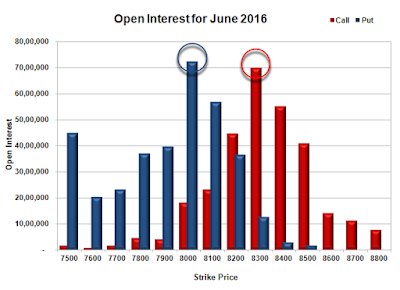 Put option 8200-8000 added 8.10 lacs OI with profit booking at 7900 and 7600 strike prices. 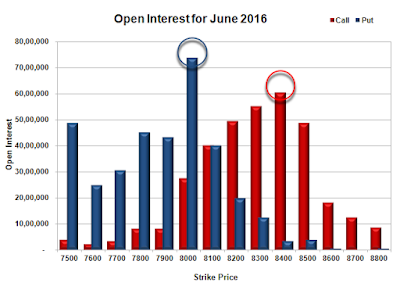 Nifty Open Interest is at 1,68,94,200 down by 5,84,025, with decrease in price, probably long liquidation. Bank Nifty Open Interest is at 17,78,880 down by 13,080 with decrease in price, probably long liquidation. 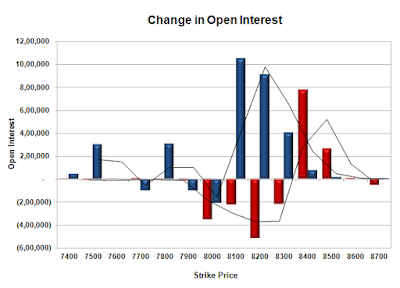 FII’s sold 9697 contracts of Index Futures, which includes net 6382 contracts long liquidation and 3315 contracts short build-up, with decrease in net OI by 3067 contracts, includes 14461 longs to 24158 shorts for the day. 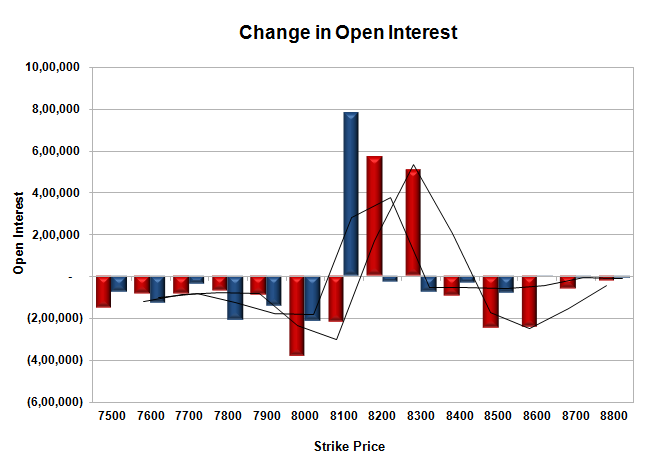 FII’s Index future open contract as on date is 178738 Longs to 57055 Shorts, Net long 121683 contracts. 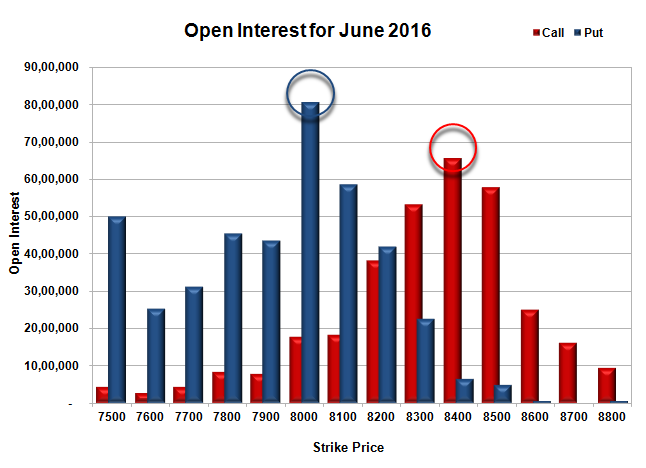 Initial support at 8200, with OI of 39.57 lacs and below that at 8100 with OI of 58.34 lacs. Initial and best resistance at 8300, with OI of 60.97 lacs and above that at 8400 with OI of 59.05 lacs. Day Range as per Option Table is 8159 - 8288 and as per VIX is 8146 - 8294 with 8226 as the Pivot. 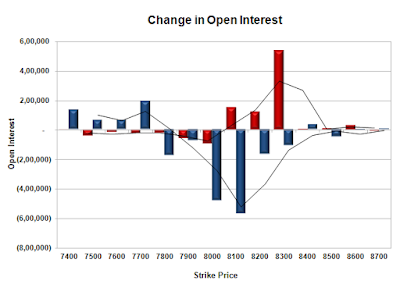 The index opened weak around 8116, but saw huge buying interest to be back in green within the first hour of trade to close strong at 8238.50, gain of 68.25 points. The broader market though was positive with 875 advances to 677 declines. Range for the series now at 8000-8400. Call option 8400-8500 added 10.41 lacs OI with short covering at 8200 and below strike prices. Put option 8300-8100 added 23.67 lacs OI with profit booking at 8000 and below strike prices. 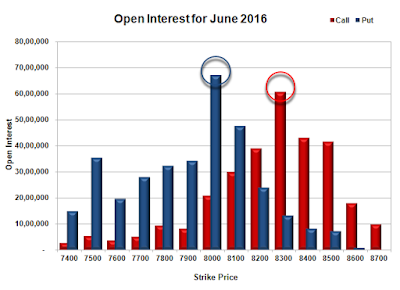 Nifty Open Interest is at 1,74,78,225 up by 4,16,925, with increase in price, probably long build-up. Bank Nifty Open Interest is at 17,91,960 up by 3,32,490 with increase in price, probably huge long build-up. 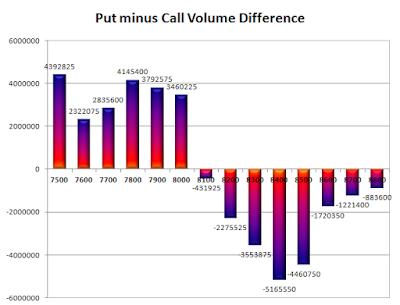 FII’s sold huge 23756 contracts of Index Futures, which includes net 5196 contracts long liquidation and 18560 contracts short build-up, with increase in net OI by 13364 contracts, includes 40071 longs to 63827 shorts for the day. 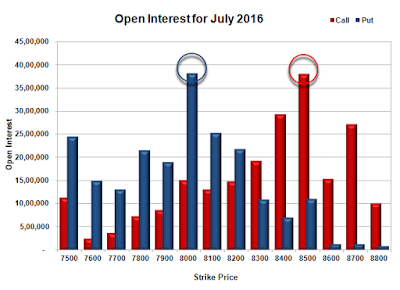 FII’s Index future open contract as on date is 185120 Longs to 53740 Shorts, Net long 131380 contracts. 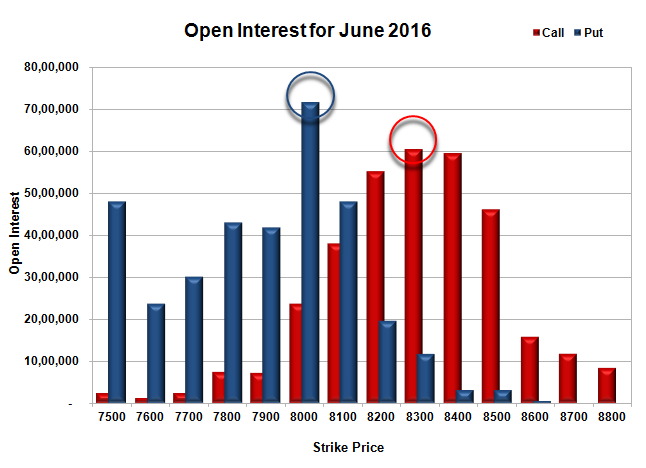 Initial support at 8200, with huge OI addition of 9.10 lacs and below that at 8100 with OI of 56.82 lacs. Initial and best resistance at 8300, with OI of 63.01 lacs and above that at 8400 with OI of 55.70 lacs. Day Range as per Option Table is 8140 - 8277 and as per VIX is 8163 - 8314 with 8197 as the Pivot. 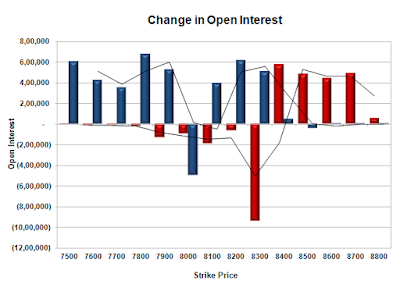 The index opened weak around 8180 and stayed weak for the entire session of trade dipping below 8100 but closed above at 8140.75, huge loss of 65.85 points. The broader market was weak with 542 advances to 1036 declines. Range for the series stays at 8000-8300. Call option 8000-8700 added 9.95 lacs OI with small profit booking at 8400 strike price. 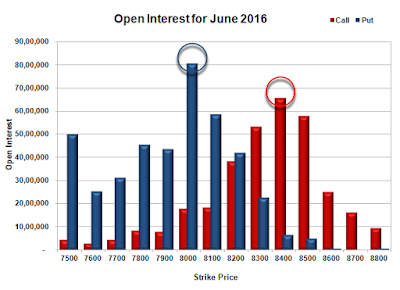 Put option 7800, 7600-7500 added 6.37 lacs OI with short covering at 8100 and above strike prices. 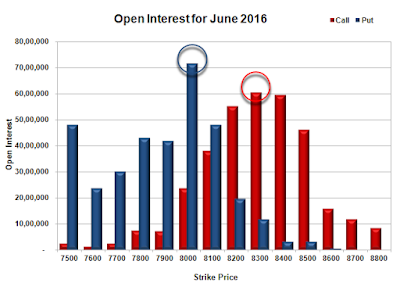 Nifty Open Interest is at 1,70,58,750 down by 15,12,825, with decrease in price, probably long liquidation. Bank Nifty Open Interest is at 15,29,490 down by 1,17,930 with decrease in price, probably long liquidation. FII’s sold 7242 contracts of Index Futures, which includes net 10913 contracts long liquidation and 3671 contracts short covering, with decrease in net OI by 14584 contracts, includes 45528 longs to 52770 shorts for the day. 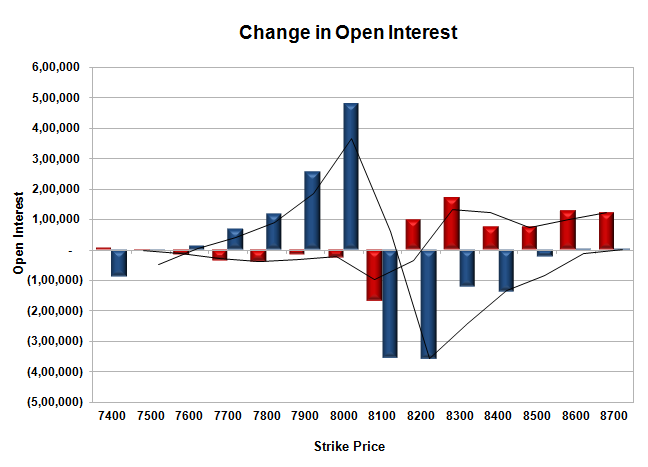 FII’s Index future open contract as on date is 194562 Longs to 31162 Shorts, Net long 163400 contracts. Initial support at 8100, with OI of 45.91 lacs and below that at 8000 with OI of 74.76 lacs. 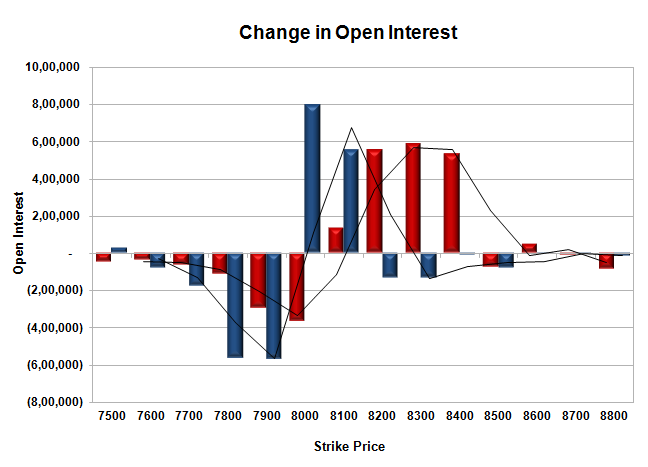 Initial resistance at 8200, with OI of 41.89 lacs and above that at 8300 with OI of 61.25 lacs. Day Range as per Option Table is 8068 - 8201 and as per VIX is 8065 - 8216 with 8132 as the Pivot.